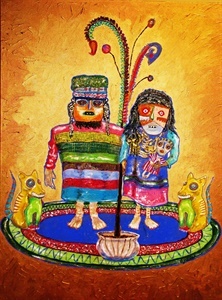 This family portrait, framed in gold, brings to life Peru's Chancay textile dolls, in all their colorful glory. 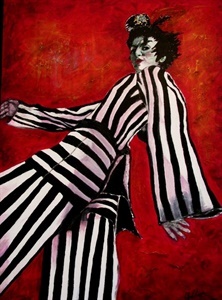 Striking portrait of a saucy, striped runway glamazon in Acrylic paint in gallery-wrapped canvas shows her glancing at the front row fashionistas. 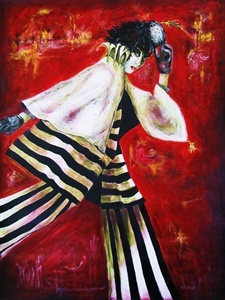 In this acrylic painting on gallery-wrapped canvas, stripe-clad woman hurries through the streets as night closes in. 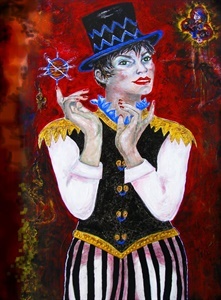 Pierrot marionette hangs, waiting, looking balefully at the puppet master who must bring him to life in this acrylic painting on gallery-wrapped canvas. 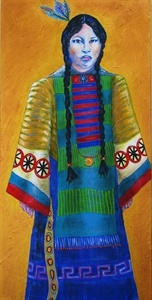 Acrylic painting on gallery-wrapped canvas features somber Indian maiden who is, nevertheless, dressed in the brightly colored garments of celebration. 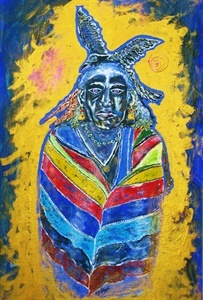 Acrylic painting on gallery-wrapped canvas portrays Native Indian clad in blanket of brilliant hues, waiting to guide you through the rocky terrain ahead. 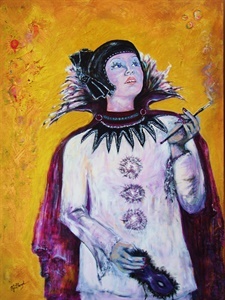 In this acrylic painting on gallery-wrapped canvas, this deco-period girl, dressed "to the nines" for the New Year festivities, contemplates the future, hoping for the best. 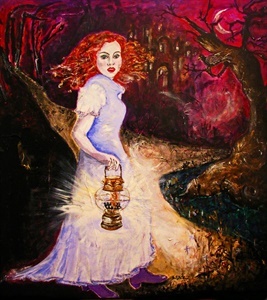 Acrylic painting on gallery-wrapped canvas features young redhead on her way home through the woods when she is startled by falling branch, a footstep...or maybe it was just the wind. 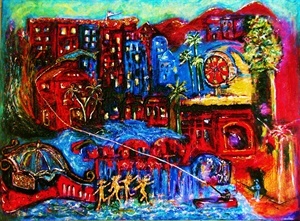 Acrylic and Oil painting displays a fantasy landscape, Brigadoon-like, with foaming, falling sea water, boats, mountains, trees, giant fish, secret tunnels and girls splashing in the surf. 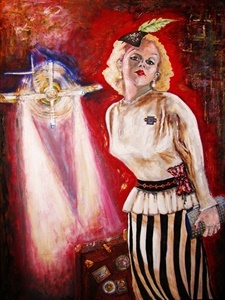 Acrylic painting tells the story of an art deco gal setting off on another fantastic adventure, suitcase in hand, feathered hat, deco broach on blouse, as the airplane rolls on the runway. Surrounded by a gold patina frame, this portrait of an ancient Peruvian family from the Chancay tribe is based on the dolls made from antique Chancay textiles. 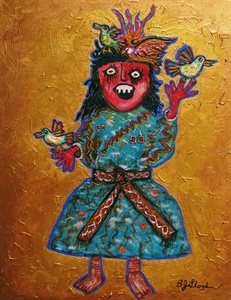 Surrounded by a gold patina frame, this portrait of an ancient Peruvian story teller from the Chancay tribe is based on the dolls made from antique Chancay textiles. 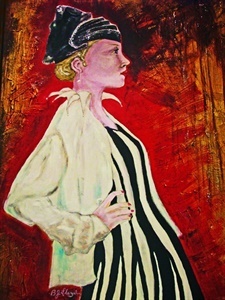 Winsome clothes horse models stripy outfit as she works the runway in this acrylic painting in a thick patina-gold frame. 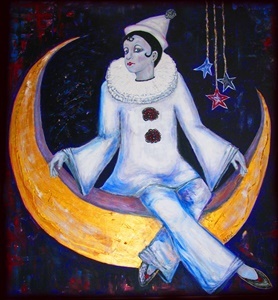 In this acrylic painting on gallery-wrapped canvas, the classical clown, Pierrot, sits on a paper moon on stage, stars dangling close by, ready to entertain the deco-period audience. 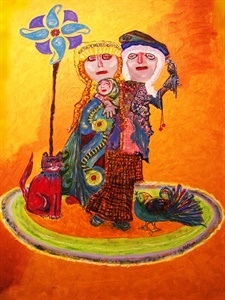 This acrylic painting on museum-wrapped canvas has the top- hatted ring master (or mistress) of a three-ring circus welcoming those who have come to see the grand circus spectacles. 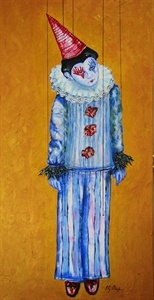 Pierrot puppet hangs on strings, waiting for puppetmaster to bring him to life again. The original of this 36"X18"X1.5" gallery-wrapped acrylic painting has been sold but a giclee on canvas or fine art paper is available. 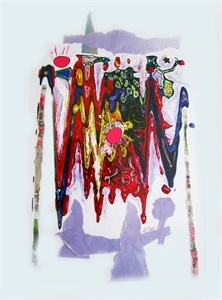 Based on giclee material and size desired. 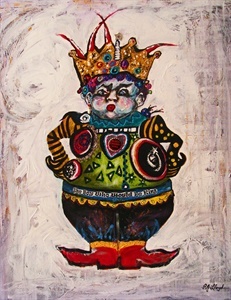 This whimsical acrylic on gallery-wrapped canvas painting shows a petulant prince who can't wait for his turn on the throne. 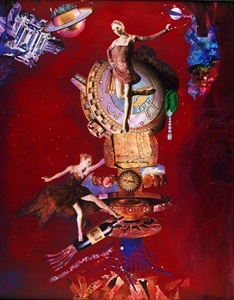 The original has been sold but a giclee on canvas or fine art paper can be made available. 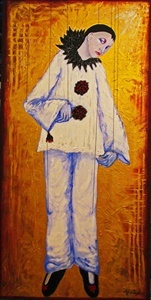 Based on giclee material and size. 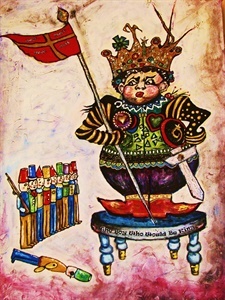 He's at it again in this acrylic painting on gallery-wrapped canvas, mustering his soldiers for the next play-battle. 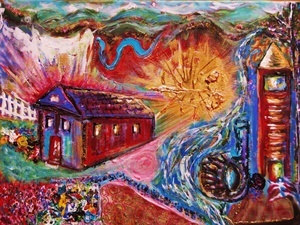 Feminist mixed media gives new meaning to "mothership". Framed in patina gold, artwork shows women breaking through the glass ceiling, rocketing upward to embark on their goals. 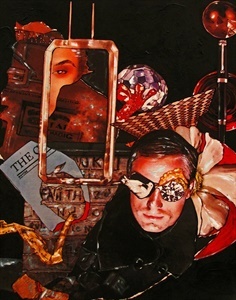 Gold-framed mixed media asked the question: why can't we be ourselves in this world, discard our masks and replace them with honesty. 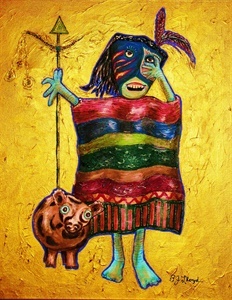 This gold-framed mixed media won first place in ABQ Review's Themed Monthly April 2012 Art Competition. Patina gold-framed mixed media displays an expectant air as everyone waits for the Next Big Thing. 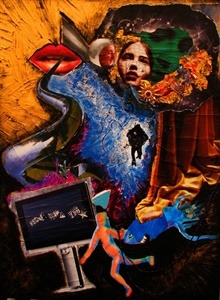 Dimensional, relief-type mixed media is a call to all who would act to preserve the resources of this planet, our home. 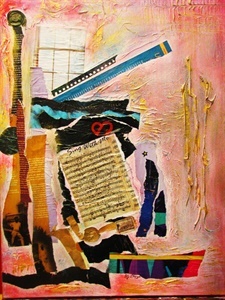 Mixed media acrylic painted collage evokes a dreamy, watercolor world filled with music and sunlight. 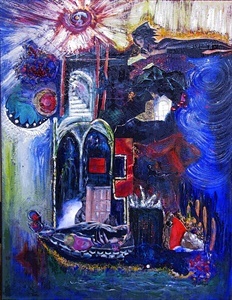 Abstract mixed media work is inspired by the band on the Titanic that played until the ship went down...with them on it, still playing. 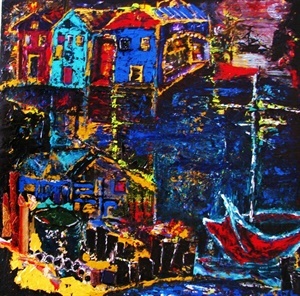 Thick impasto acrylic painting created with knife and brush, interprets an evening on MacMillan Wharf in Provinceton, MA with lights flickering, boats bobbing and the smell of lobster in the air. 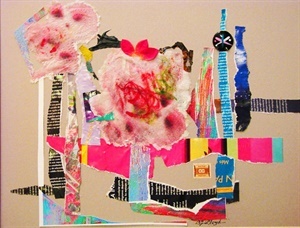 Abstract mixed media in warm pinky-peach tones is the artist's interpretation of an inviting apple orchard. 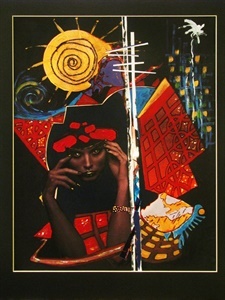 Surreal mixed media work framed in black has lovely lady literally putting on her face for an evening out. 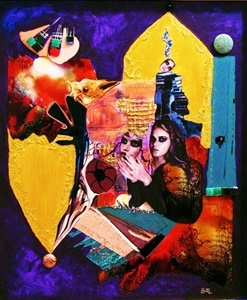 Abstract black-framed mixed media catches a 007 vibes as pieces of the latest mystery swirl about the spy master's mind. 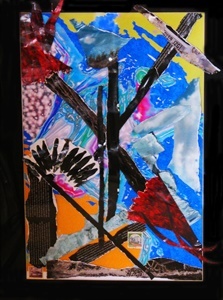 Framed and matted collage shows off the dynamic movement and colors of a lively interpretation of King Arthur's sword. 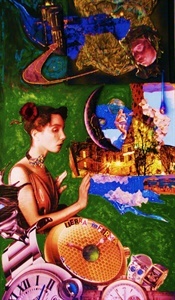 Fantastical abstract collage landscape lets you see throughthe woods and beyond the sea. Mysterious abstract acrylic painting on gallery-wrapped canvas is a dream filled with water, flight and staircases leading nowhere. This textured mixed media "peels back" the window to drink in Cape Cod Bay. 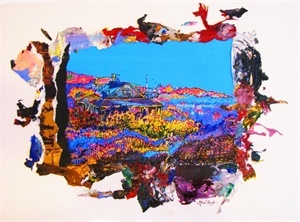 Colorful fantasy landscape in acrylic on museum-wrapped canvas depicts asteroids landing in a brilliant blast of light on the New Mexican desert.